champion’s parade down Main Street U.S.A., in Disneyland park. Manning, one of the greatest quarterbacks in NFL history, smiled and waved to fans as he rode on a float with his family in an unforgettable moment. 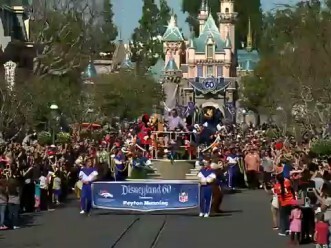 The parade, coming one day after the NFL staged Super Bowl 50, was held at the Disneyland Resort, which is celebrating its 60th Anniversary Diamond Celebration through summer 2016. Manning joins an all-star lineup of heroes from sports and beyond who have celebrated milestone accomplishments by celebrating at either the Disneyland Resort in Anaheim, California, or Walt Disney World Resort in Lake Buena Vista, Florida. The lineup includes Peyton Manning’s brother Eli Manning, Tom Brady, Emmitt Smith, Coach Jon Gruden, Joe Montana, John Elway, Jerry Rice, Doug Williams, NBA stars Michael Jordan, Kareem Abdul- Jabbar and Magic Johnson, and NHL goalie Patrick Roy.